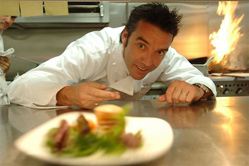 I stayed at Dunbrody Country House Hotel & Restaurant in September 2007 and had the opportunity to meet with Kevin Dundon, who together with his wife Catherine, own the elegant and stylish luxury hotel that is a member of the Small Luxury Hotels of the World. The 22-room and suite hotel is set among 200 park-like acres with herb, vegetable, and fruit gardens, which Kevin and his team use at both the restaurant as well as at the Dunbrody Cookery School. When not working in the kitchen creating new recipes, teaching at his cookery school, or appearing on RTE - The Afternoon Show and UK Food Live, Kevin enjoys spending time with his wife Catherine and their three children, and also playing with Delago, his Vietnamese pot-bellied pet pig. "Poussins are the smallest chickens available to buy. I like them because they are very tender and quick to cook. Each one is a perfect portion size, making them great for dinner parties." - Kevin Dundon, from his Full On Irish cookbook. Method: Arrange the spring onions in a roasting tin. Season generously and toss in half the olive oil until evenly coated. Loosen the skin around the neck of each poussin and push under a little of the butter until evenly spread over the breast, then push a sage leaf down each side so that they are clearly visible. Arrange the poussins on a bed of spring onions and scatter over the garlic. Drizzle over the remaining olive oil and season to taste. Roast for 35 minutes until the poussins are completely tender and golden brown. Leave to rest in a warm place for at least 10 minutes. To serve: Heat the remaining knob of butter in a pan and quickly sauté the chard for a minute or two until wilted. Season to taste and divide among warmed serving plates. Add some of the roasted spring onions to each one and sit a poussin on top. Scatter over the sage leaves to garnish. "This is our signature dessert at Dunbrody and really isn't that difficult to make. It is an intensely chocolatetey experience and never fails to impress - just make sure you use the best possible quality chocolate. There is no doubt in my mind that there is something about chocolate that is addictive. It contains several stimulants, including caffeine and pleasure-inducing endorphins - no wonder it tastes so good." - Kevin Dundon, from his Full On Irish cookbook. Select 6 x 200 ml (7 fluid ounce/1 scant cup) in capacity teacups and line them with cling film. Melt the plain chocolate in a heatproof bowl set over a pan of simmering water. Leave to cool a little. Lightly beat the egg yolks, then whisk into the melted chocolate. Whip the cream in a bowl until you have achieved soft peaks, then whisk into the chocolate mixture. In a separate bowl, beat the egg whites until stiff, then fold into the chocolate mixture. Divide among the lined teacups and chill for at least 2 hours or, preferable, overnight. When the chocolate mousse has set, melt the Mars bar in a small pan. Remove from the heat and fold in the cornflakes. Leave to cool a little, then add a layer to each chocolate mousse to form a crunchy base. Place in the freezer for at least 2 hours; (up to one month is fine, if required). Method: Melt both chocolates in heatproof bowls set over pans of simmering water. Line a baking sheet with cling film. Spoon on blobs of both chocolates and then cover with cling film. Gently roll to form one even layer. Place in the freezer for at least 10 minutes (or for up to one month, if required). Method: Heat the chocolate and cream for 1-2 minutes until melted, stirring constantly. The consistency should coat the back of a wooden spoon. If you think that it is too thick, add a little more cream. Invert the teacups onto a wire rack set over a clean tray and then carefully peel away the cling film. Ladle a little of the chocolate ganache over each one until completely coated, allowing the excess to drip onto the tray below. Using a spatula, scrape the excess chocolate ganache into a pan and reheat gently. Leave to a cool a little. To Serve: Using a fish slice, transfer the coated chocolate mousses onto serving plates and leave to defrost at room temperature for 10 minutes, then decorate with the strawberries and raspberries and drizzle around the cooled chocolate ganache. Now, working quickly, remove the sheet of chocolate shards from the freezer and peel away the cling film, then break into shards and stick two into the top of each Dunbrody Kiss. Read other articles on Dunbrody Country House Hotel & Restaurant in the Hotels and Resorts, Restaurants, Spas, and Luxury Products sections.